The Buttercup quilt block is one of many different flower blocks. 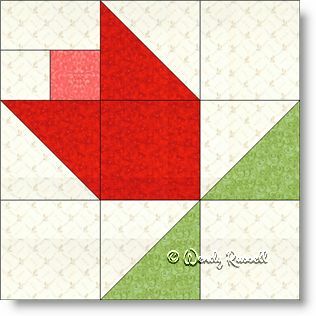 This is a great block for beginners because it contains only squares and half square triangles. For those of you who want to make it more challenging, then I would suggest you make this quilt block as a 6 inch version. The sample quilt layouts illustrated demonstrate that by simply rotating several of the quilt blocks you can produce a totally different look. One of the quilts shown sets the blocks side-by-side while the other lays the quilt blocks out on point.